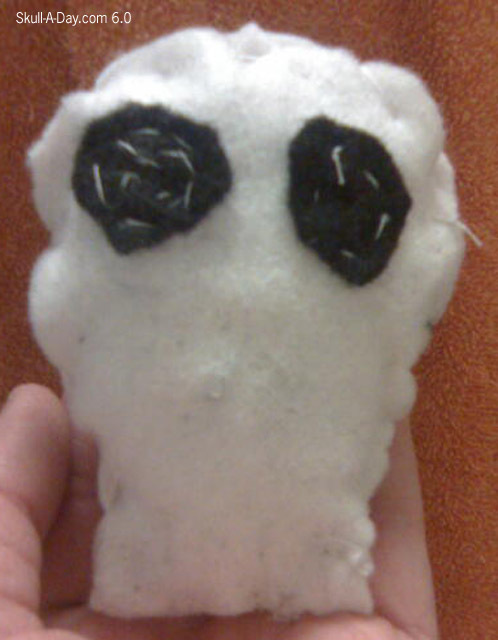 Mark Taylor's 9 year old daughter Hollee-Ann, from Luton, UK, made him this cuddly skull. He explained that she made it out of a bag of felt/fleece fabric, hand stitched it, and stuffed it with cotton wool. I love seeing what kids create more than adults, because their vision and use of materials is so open and creative. My daughter also made a stuffed skull recently, so when I saw this, I instantly smiled. Sewing projects like these remind me of when I 1st started sewing as a young kid, but I never made anything as cool as a stuffed skull. This contest has ended. Thanks to everyone who participated with your comments. Stay tuned for more great giveaways coming soon! Don't be late for your meeting! Remember that you only have until 11:59:59 Eastern Time Friday, March 1st to get entered to win a FREE "Skeleton Office" prize pack from CyberINK Online. 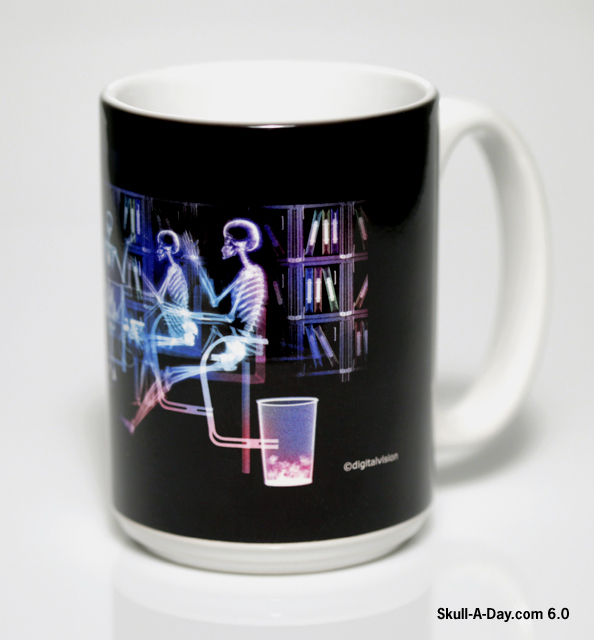 Here's your chance to win 1- 18"x24" poster, 1- coffee mug, and 1- mouse pad featuring the "Skeleton Office" design available from CyberINK Online. Don't worry if you don't win, you can always feel like a winner by picking up any of the awesomely cool skull designs for all of your gadget needs at CyberINK Online. Thanks again, Jean! 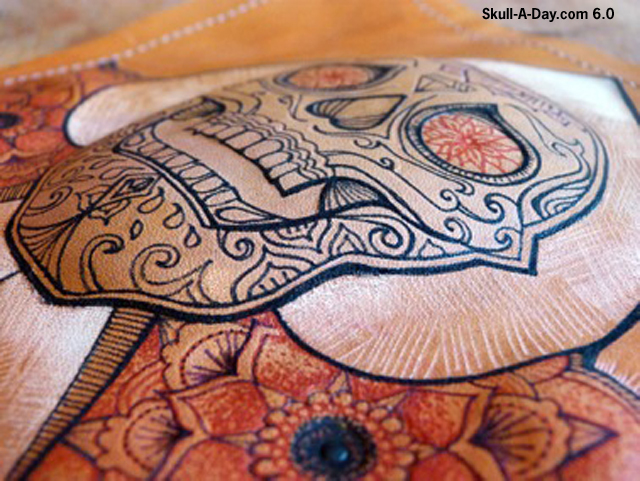 Self taught artist, Zofsallonika, hails from Thessaloniki, Greece and is here today with this intricate and colorful skull. I can't decide if this reminds me more of a fingerprint or a skull with worms crawling on it but either way I still like the intensity in the patterns. Thanks for submitting it, zofsallonika! 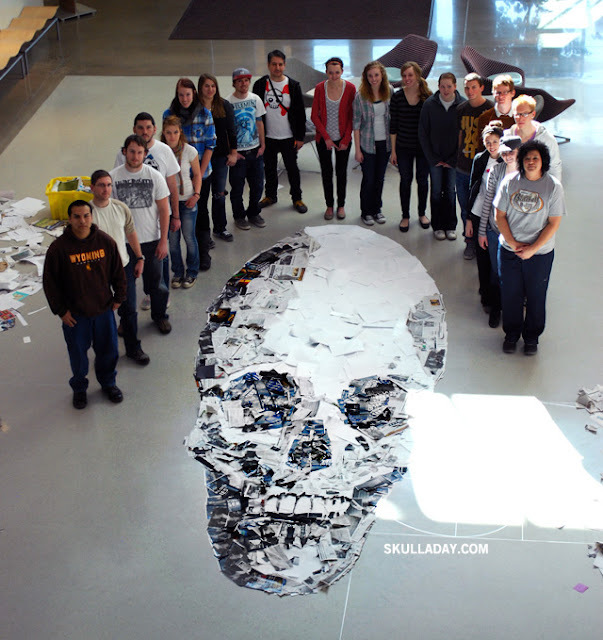 "CyberINK is a woman-owned, 15-year-old company in the Chicago Metro Area that sells quirky skeleton-themed products to people, museums and book stores. Since 2006, CyberINK has also been an independent publishing company that publishes books on a variety of topics. Owner Jean Latz Griffin, former Chicago Tribune reporter, has certified geek credentials and is working on a novel of historical fiction that includes talking cats and shy owls." 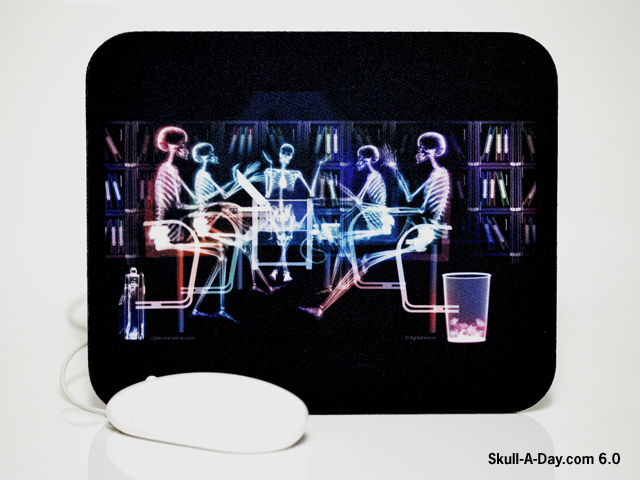 PRIZE INFO: One "Skeleton Office" prize pack consisting of 1- 18"x24" poster print, 1- coffee mug, and 1- mouse pad, all featuring the "Skeleton Office" design. 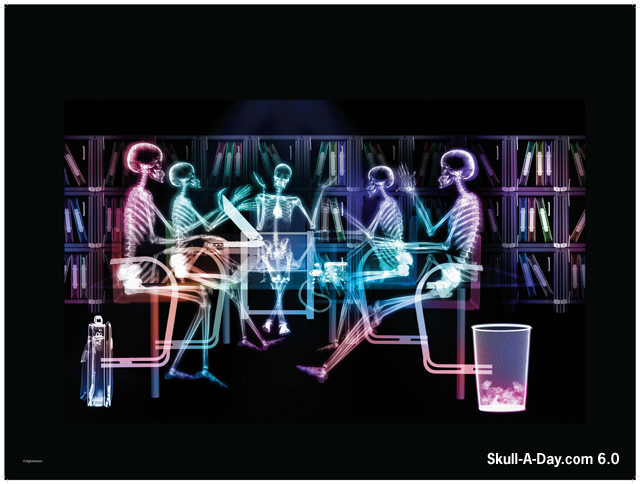 HOW TO ENTER: Leave a comment stating what matter of business these skeletons might be discussing. It could be anything from TPS reports to which stapler they like the best, the Swingline or the Boston. Anything! CONTEST CLOSES: 11:59:59 PM Eastern Time Friday, March 1st. PRIZE SHIPS: To skull lovers worldwide whether you work in an office or not. IF YOU DON'T WIN: You can always get your own skeleton supplies from CyberINK Online, which also features tons of other skull and skeleton designs. Thanks for sharing your office space with us, Jean! Somewhere in RVA Stacie Alvarado found this beautiful shell, and was kind enough to share it and this tongue twister, "Stacie sees skulls in shells by the seashore." Try saying that 10 times fast. This first person who does will receive a renewed sense of confidence in their linguistic skills. Don't forget to share your hidden skull finds(and possible tongue twister) with us. Thanks for bringing us to the beach with you, Stacie! 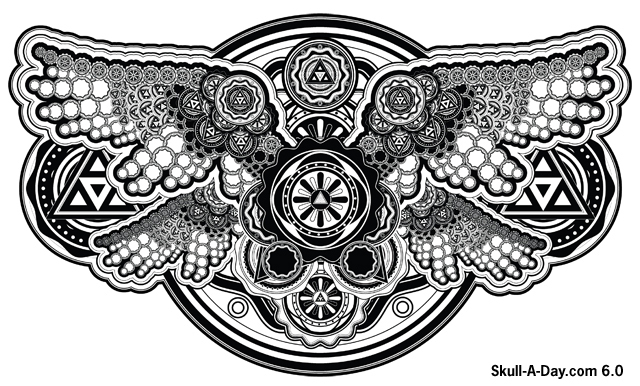 This "winged skull" illustration comes from Ryan Harris. 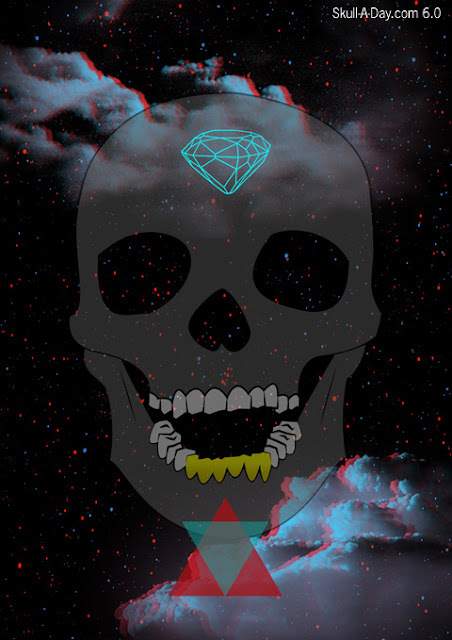 A collage of geometric shapes patterned into a skull with some wicked headgear. The first thing I thought of when I saw this in our inbox was a robotic style Mayan headdress. The almost hypnotic symmetry draws you into a geometrical vortex of mathematical proportions. Thanks for sharing your work, Ryan! 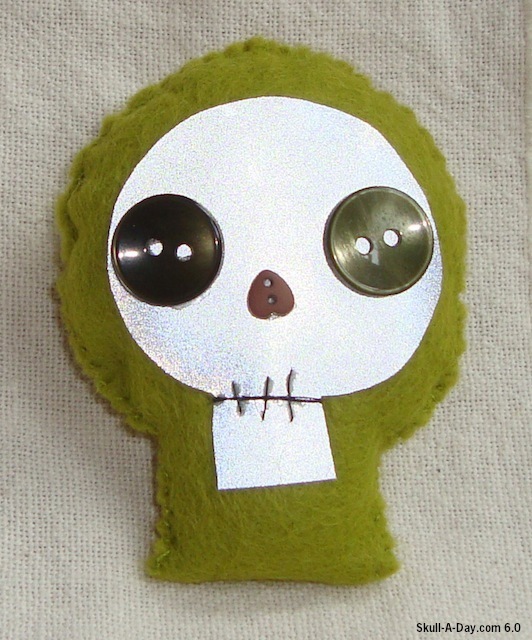 Cat Bruce from Scotland showed off this skull badge [pin] made with buttons, felt and reflective fabric. What a great way to incorporate a little safety with fashion. I dabbled a little with the reflective material way back HERE, but never thought of using it to be the main focus of the design perhaps I need to revisit this material again in the future. Thank you for sharing your work with us. Don't forget that you only have until 11:59:59 Eastern Time on TONIGHT to get entered to win a FREE set of 5 bronze skull lanyard beads from Skeleton Knives. Don't miss your chance to win a FREE set of five (5) bronze skull lanyard beads from Skeleton Knives. The skulls include 1-African, 1-Dios de Muertos, 1-Alien Polished, 1-Alien Satin, and 1-Gas Mask. These are made with vertical holes to accept paracord with the exception of the African skull which has horizontal holes. Each skull measures approximately 12mmx15mm. Don't worry if you don't win, you can always feel like a winner by purchasing your own lanyard beads from Skeleton Knives. Thanks again, JT! Louis Cordova said, "This was my first time at wood burning. Thought it came out good, so I made it into a jewelry box." My favorite thing about wood burned pieces of art, is the scent. There is something lovely about using a hot metal to burn wood into designs. If Louis hadn't mentioned it, I would have never known this was his 1st attempt at wood burning. 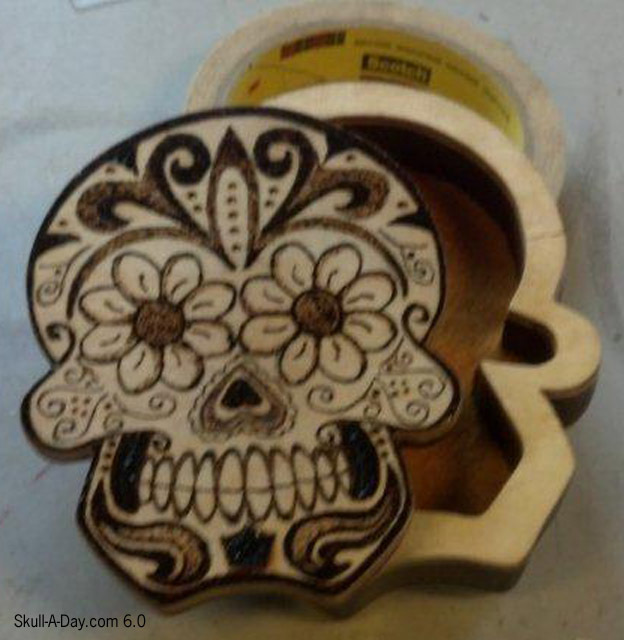 I'm glad he was pleased with his work and turned his skull creation into a practical jewelry box. Shayna Butler of Weaver, AL told us: "I love the Skull-A-Day site I just read your submission page and had no idea you started it in 2007. It is awesome that you stuck with it, and that now you include art and images from others. This image is a painting I did for a friend." What I love most about this piece are the sparrows. They remind me of of an ancient crown in the way that they sparrows seem to supporting the sunlight disk on the head. Thank you for your kind words about the site, we are glad that you found us and that you jumped right in submitting a piece of your work. Don't forget that you only have until 11:59:59 Eastern Time on Friday Feb. 22nd to get entered to win a FREE set of 5 bronze skull lanyard beads from Skeleton Knives. Fouapa is a French illustrator based in Paris who works around the notions of stupidity, vulgarity, and nostalgia. 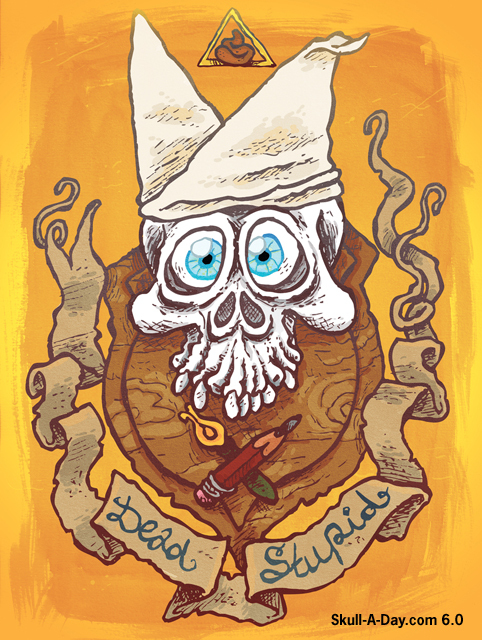 His "Dead Stupid" skull displays a dunce who's not afraid of death. This is a great comical look at what could happen if you don't use the brain inside your skull. To quote an American rapper, but using a French twist, "La vie sans la connaissance, c'est la mort dans le déguisement". Be sure to put your skull to a good and smart use today, and every day for that fact. Thanks for the reminder, Fouapa! When the overhyped zombie apocalypse finally gets here (some day) it will be survival mode for everybody. That will have to include the incorporation of a trusty survival knife and lanyard to get you through the years of reverting to frontiersman like conditions. Now you have a way to easily identify your knife while being skullified at the same time. JT from Skeleton Knives is here today to offer a set of 5 of his 2012 cast bronze lanyard skull beads. These are cast using the lost wax process and since they are bronze should last many centuries. A sturdy piece of hardware guaranteed to last longer than any brain eating ghoul. 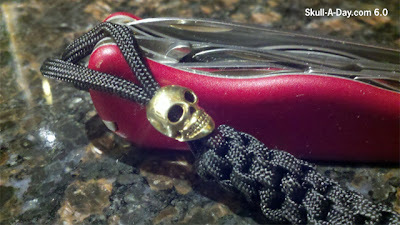 PRIZE INFO: One (1) set of five (5) bronze skull lanyard beads from Skeleton Knives. 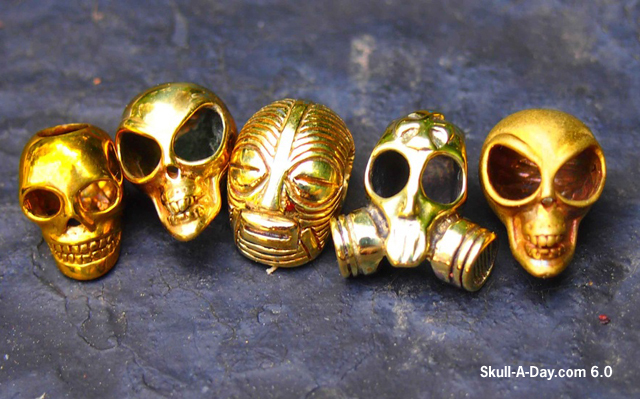 The skulls include 1-African, 1-Dios de Muertos, 1-Alien Polished, 1-Alien Satin, and 1-Gas Mask. These are made with vertical holes to accept paracord with the exception of the African skull which has horizontal holes. 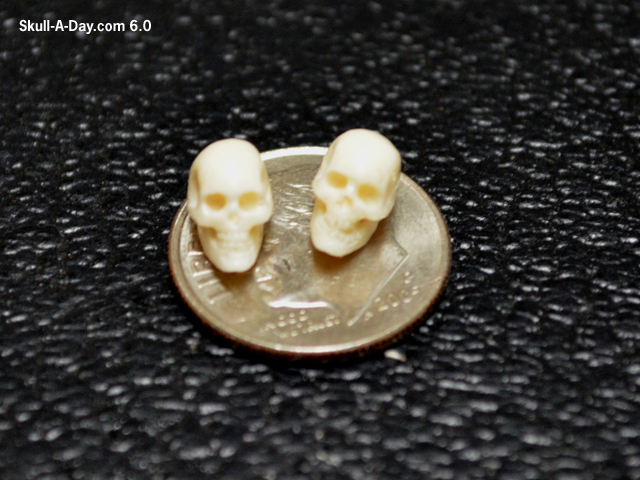 Each skull measures approximately 12mmx15mm. HOW TO ENTER: Leave a comment stating a useful tool that you would want to have around after this supposed zombie apocalypse occurs. In case you can't tell I'm a little skeptical, yet I still want to prepare for the unexpected. CONTEST CLOSES: 11:59:59 PM Eastern Time Friday, February 22nd. PRIZE SHIPS: To skull lovers worldwide. The need for survival is worldwide if not universal. Everyone is invited to enter. IF YOU DON'T WIN: You can always get your own skull lanyard beads from Skeleton Knives, as well as a few other useful tools that are as cool as they are enduring. Thanks for sharing your work with our readers, JT, and for helping to properly prepare us for whatever may happen. 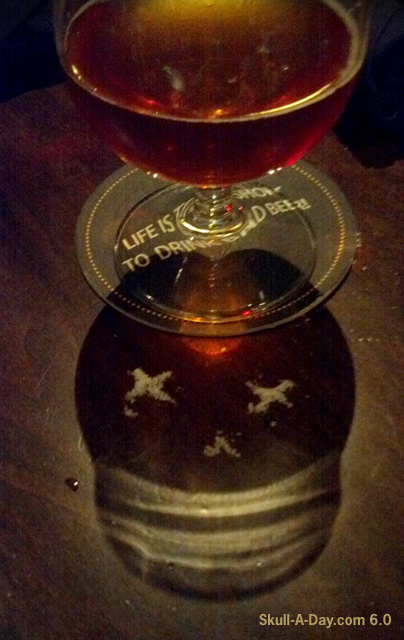 Today's simulacra comes from Ryan Whisler who snared this smiling skull enjoying some good times at the Sedona Taphouse in Midlothian, VA. 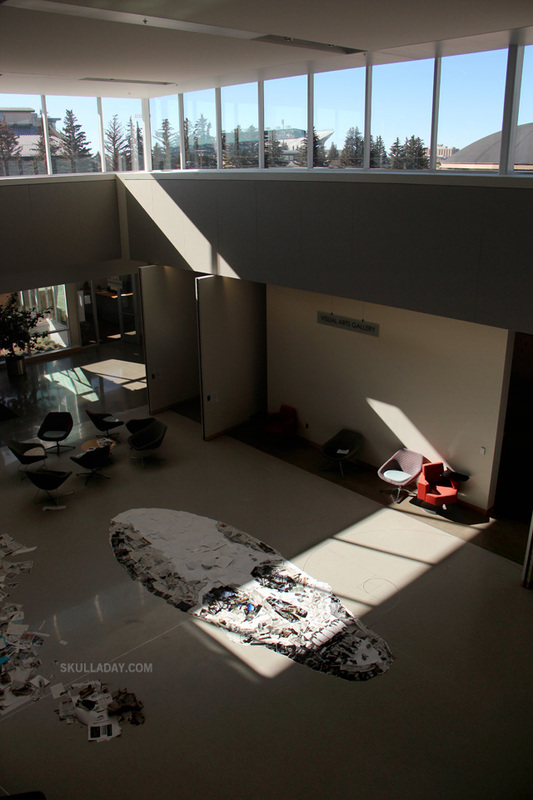 The light and shadow cast by the glass suggested a grinning skull that was competed with salt for the eyes and nose. Judging by the shape of the glass and the color of the beer I would guess that this might be some type of Belgian brew. I'll run with that idea and call this "spirit" Bernie the Belgian Beer Glass Skull. Everyone has a great time when Bernie makes an appearance. Thanks for sharing your good time with us, Ryan! p.s.- I couldn't agree more with the coaster. 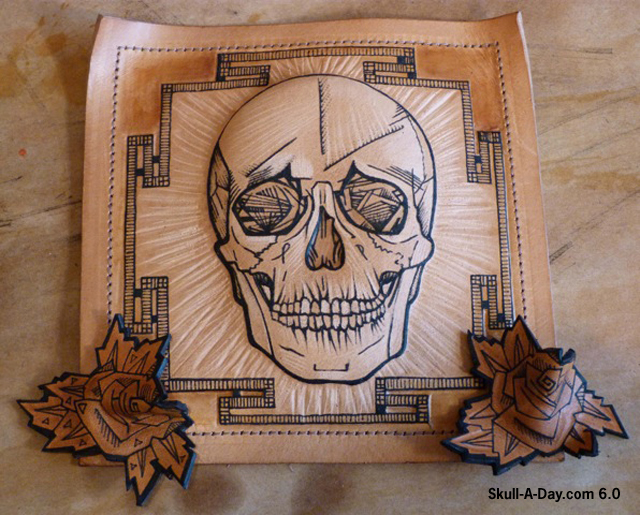 Over in the UK Dionne Marshall is mixing styles with her "tattooed and tooled leather" works of art. 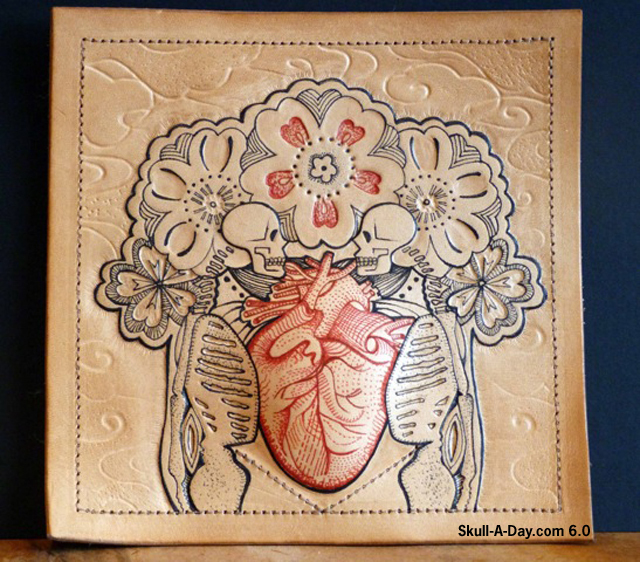 She uses untreated natural veg tan leather which she decorates by tattooing individually(with a tattoo machine) before tooling, embossing, engraving, etching & repousse onto the leather. Dionne gets her inspiration from the artistry & imagery of modern tattooing, mixed with a never ending love of skulls, geometry(the first and noblest of sciences), Japanese, lines & patterns. 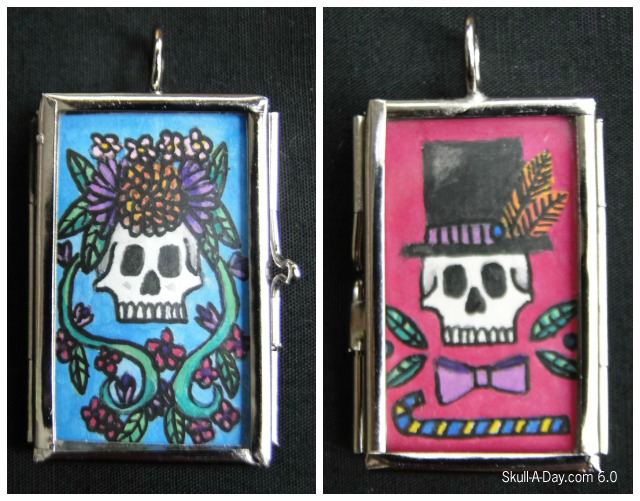 This is just a sample of the plethora of awesome skulls in her etsy store. Obviously I'm a huge fan of tattoos, but I've never seen anyone use a tattoo machine on leather. The results you achieve are amazing, Dionne. The tooling and embossing add so much depth to the colored lines. 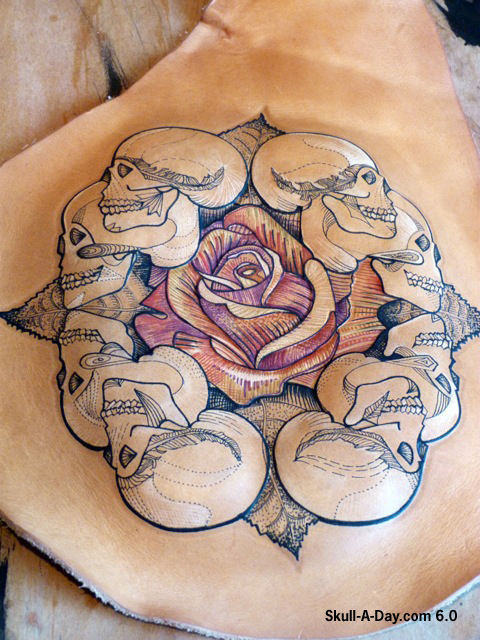 Tattoos are forever and well taken care of leather lasts a lifetime so these pieces could be around for eons. Thanks for sharing your artful works of perseverance, Dionne! 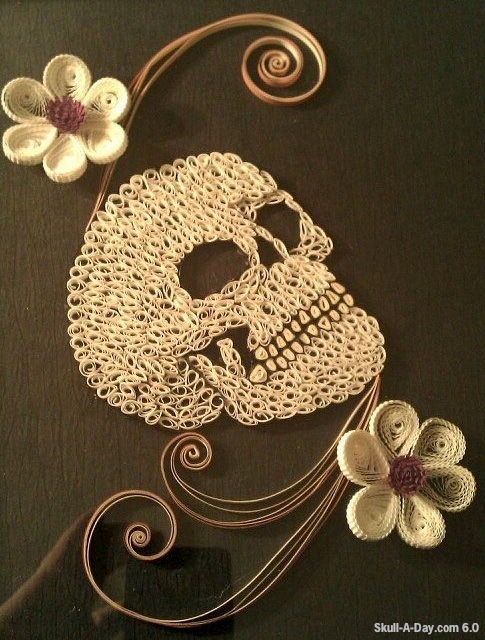 Sharee Surrett from Hampton, VA shared with us a quilled skull that she created. Since the Skullmaster posted his 312. Quilled Skull, back in 2008, there have been a few others who have submitted work in this medium each one different. I am truly amazed at the uniqueness of this art form and its ability to be manipulated into exactly what you need it to be with some pinching. Thank you for sharing this excellent piece with us, and adding another example of this art style for our Skull-A-Day family to admire or be inspired by. THIS CONTEST IS NOW CLOSED, THANK YOU FOR PARTICIPATING! Don't forget you have until 11:59pm Eastern USA Time, TONIGHT, Friday, February 15, 2013 to make an entry comment to win a "Til Death Do Us Part" heart skulls created by Joshua Harker. You can find the original contest post by clicking the side bar ad, or visiting this link. The other day, I was browsing Instagram on my phone in search of great art. 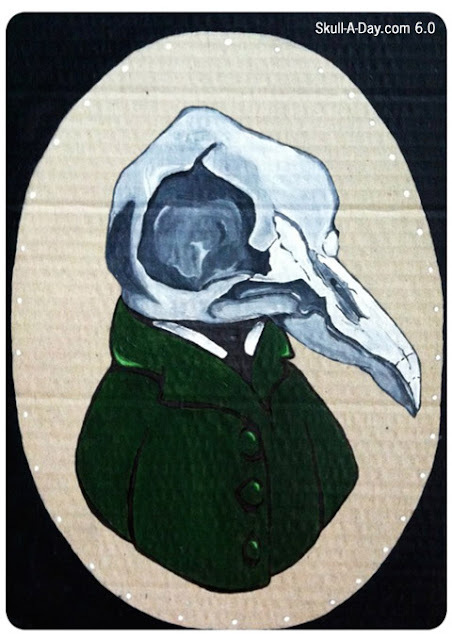 I came across an ongoing series of animal skull artwork made by Jennifer of Quirky Bones. I was so impressed with her artwork, that I asked her to submit it to us. Luckily, she responded and submitted several amazing paintings. Jennifer explained that Quirky Bones is "a personal project which I have created to bring myself in front of the viewing eyes of you beautiful people. I am based in the rural town of Wagga Wagga, Australia and you can often find me wondering through the worlds of Photography and Illustration, whilst listening to swell tunes." 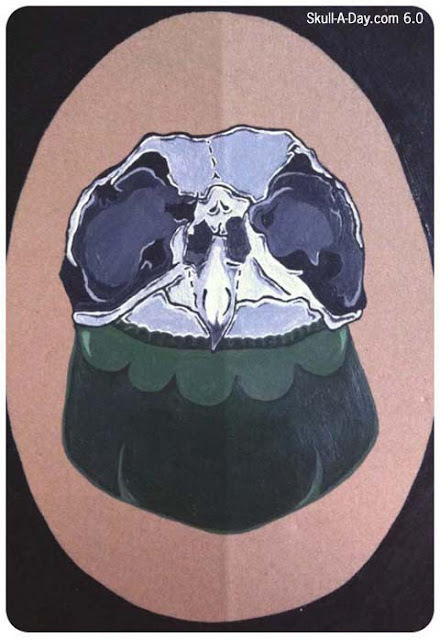 We see a lot of artwork using human skulls as the motif, but rarely see animal ones. 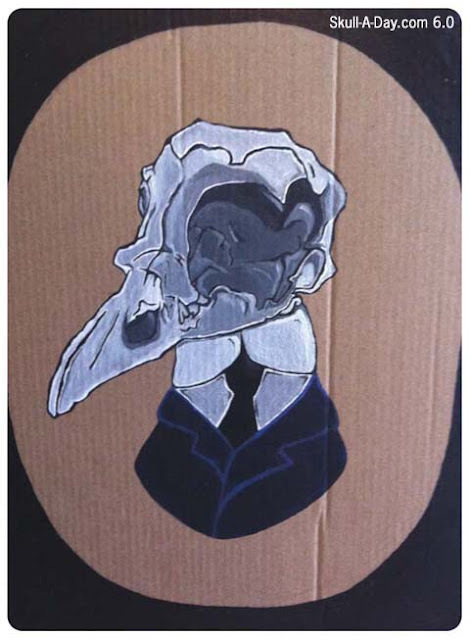 Jennifer paints her amazing animal skull portraits on cardboard. 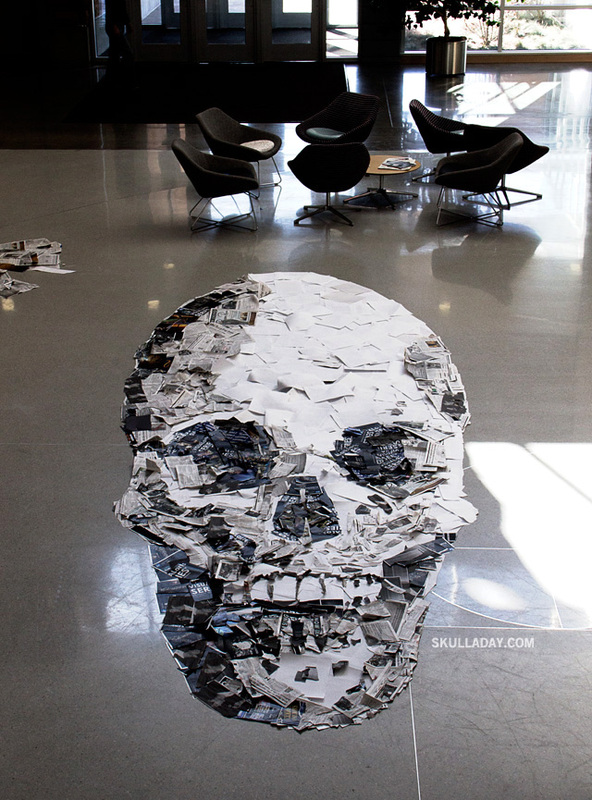 She uses a variety of animal skulls as her inspiration. I love the depth and character of each one. You can find more of Jennifer's work on Instagram (quirky_bones), Facebook, and Tumblr. She is free for commission so feel welcome to email her at quirkybonesillustrations@gmail.com. 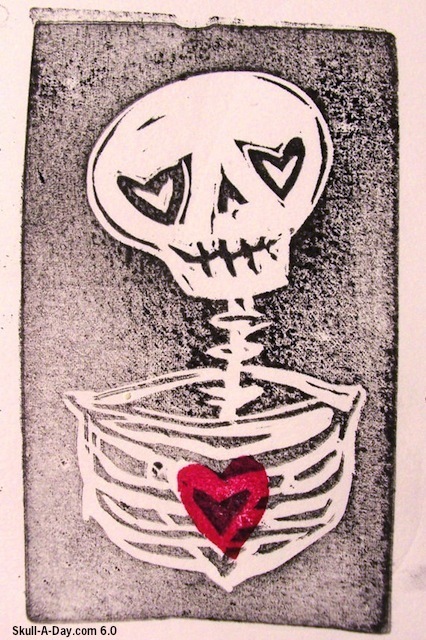 Artist/Printmaker Coralette Damme, AKA The Crafty Hag, in St. Petersburg, FL shared with us a pair of hand printed Valentine's Day appropriate note cards that she created. One may be a bit skeptical to receive a token of affection with a skull on it. 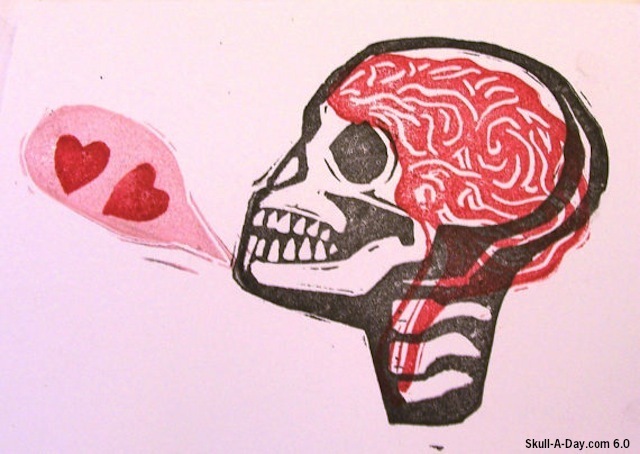 However, if you are up on your Christian Saint reliquary knowledge you will understand how a skull and St.Valentine's Day go together perfectly. (HERE is the visual answer for those not familiar). 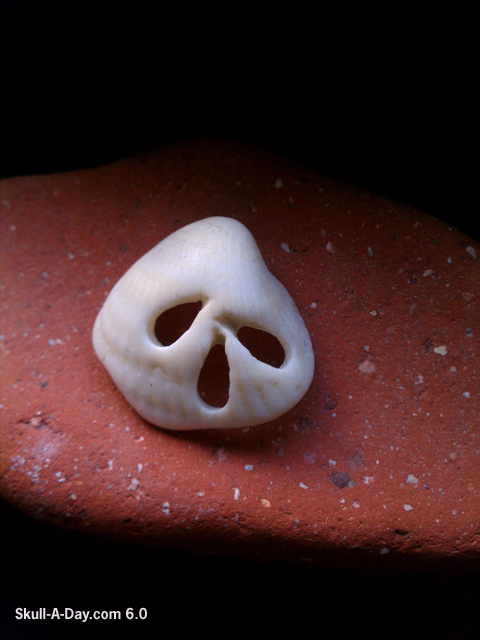 It seems to me that a skull would be the natural symbol opposed to a heart. Thank you for submitting your excellent creations to us and allowing us to share them and reflect upon them. 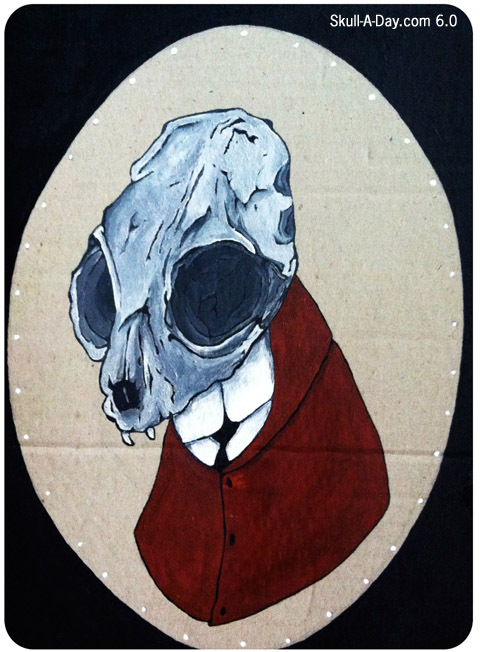 Don't forget you have until 11:59pm Eastern USA Time Friday, February 15, 2013 to make an entry comment to win a "Til Death Do Us Part" heart skulls created by Joshua Harker. You can find the original contest post by clicking the side bar ad, or visiting this link. Lisa Smith wants us to take a gamble on her skull works and "roll them bones" with these skull dice. These handmade ceramic dice let you take a chance in life by rolling a pair of skull eyes. I don't play any dice games when I do go to the casino, but I would spend what I had in my pocket to buy this pair from the dealer. Luckily you can skip that trip and get your own pair here. 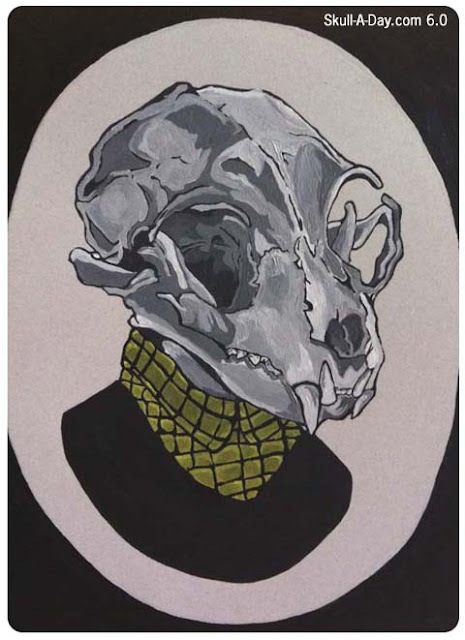 Lisa has a lot of other great skull pieces at her site as well. Thanks for rollin' your bones our way, Lisa! 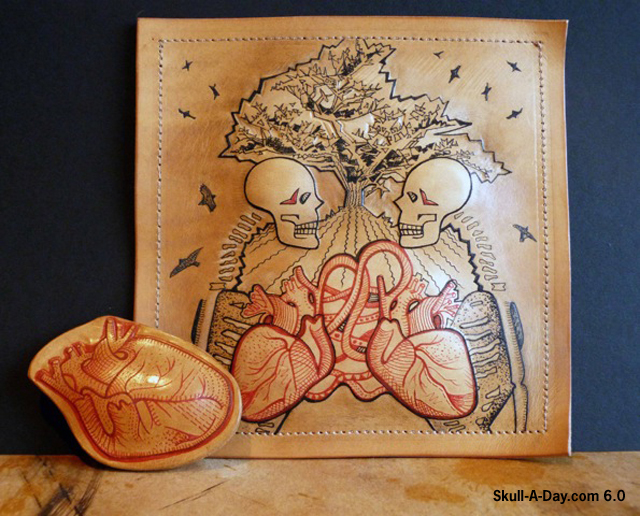 In celebration of Valentine's Day this week and to show off his love for the the Skull-A-Day community for supporting his past projects, Joshua Harker is giving away one of his recently created "Til Death Do Us Part" heart skulls to one lucky reader. Sculptor, inventor, imagination architect, digital adventurer, and troublemaker. Joshua Harker is one of the most recognized artists working in the 3D printing medium. He became known for "making the unmakeable" with his Tangles series which hold rank as the very first organic forms of such complexity to ever be created. He most recently became an internet sensation using crowd-funding to disseminate his art and currently holds the #1 & #4 most funded Sculpture projects ever on Kickstarter (Crania Anatomica Filigre & Anatomica di Revolutis). Joshua's work has appeared in TIME Magazine, WIRED, Huffington Post, Wall Street Journal, The Economist, MSNBC, TED Talks, National Geographic, Cool Hunting, Venture Beat, Boing Boing, as well as countless others. 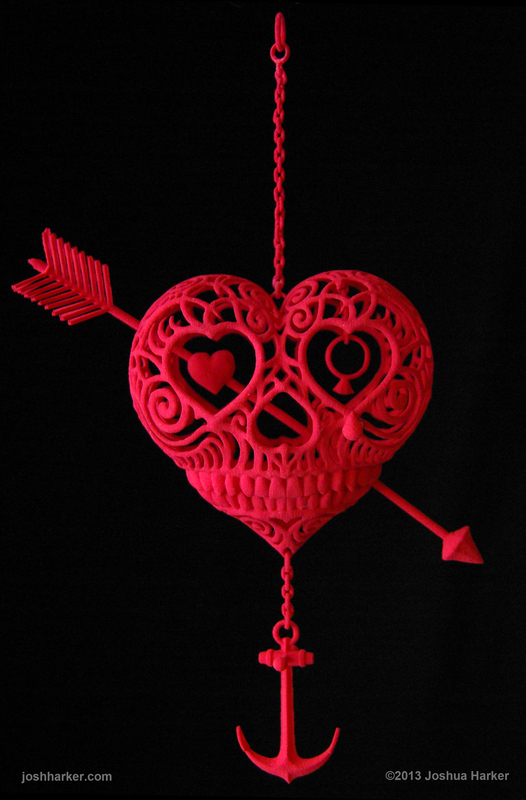 PRIZE INFO: "Til Death Do Us Part" heart skull in red. HOW TO ENTER: Leave a comment below telling us where you would take this heart skull on a date. CONTEST CLOSES: 11:59:59 PM Eastern USA Time Friday, February 15, 2012. IF YOU DON'T WIN: This piece is available in alternative colors as well as other work created by Joshua in his store HERE. 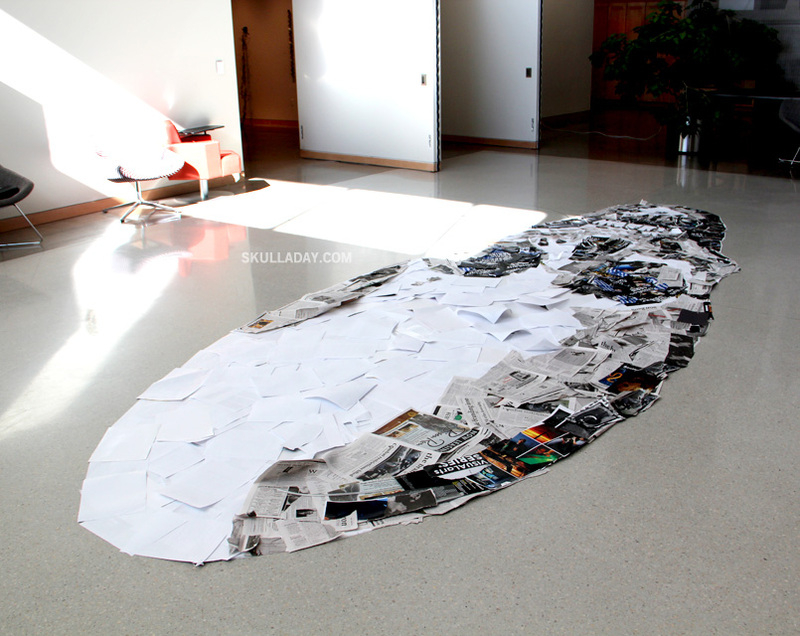 I was given access to the large lobby of the new Department of Art building and it was decided that I would work with a material that was plentiful in the building: paper. Specifically paper that had been collected for recycling purposes (including the posters announcing my talk previous in the week). The piece was created anamorphically (in the spirit of Hans Holbein's The Ambassadors) so that it only looks correct from one spot in the room (in this case on the landing of the staircase between the lobby and 2nd floor). It measures 19'-3" x 7'-4" (5.8 x 2.2 meters). The piece is a temporary installation that will of course be recycled after it is dismantled. Thanks to all of the students who skipped class to help me out and especially to my host Jenny Venn for suggesting it! Paul Lane is a BIG skull hunter. He's made use of satellite imagery to bring us today's submission. He sent this screen capture and this note, " Just heard you discussing your skull project on Radio National Australia. 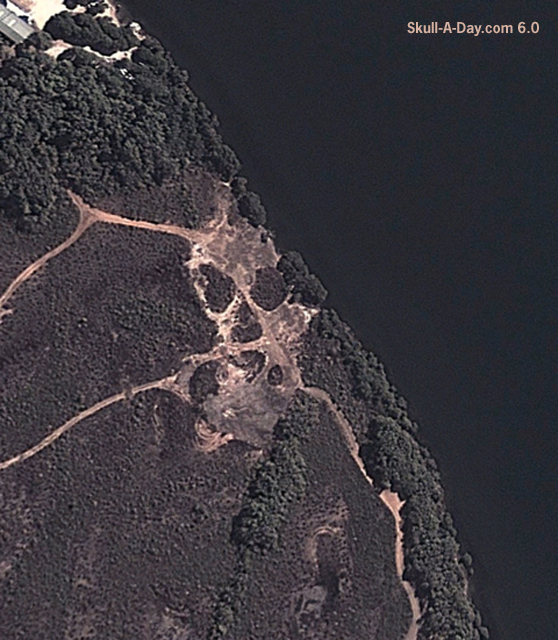 This is one of my favourite skulls in the landscape. Unfortunately the chin has changed and lost clarity since I first found it but you can still pick out the skull shape. It is about 1km north of Augusta in SW Western Australia." It's amazing to see what we can find on our planet using the satellite imagery that is available today. I'm glad Paul kept us in mind when he made his discovery. Maybe you've seen one, too? Be sure to submit it to us if you do. 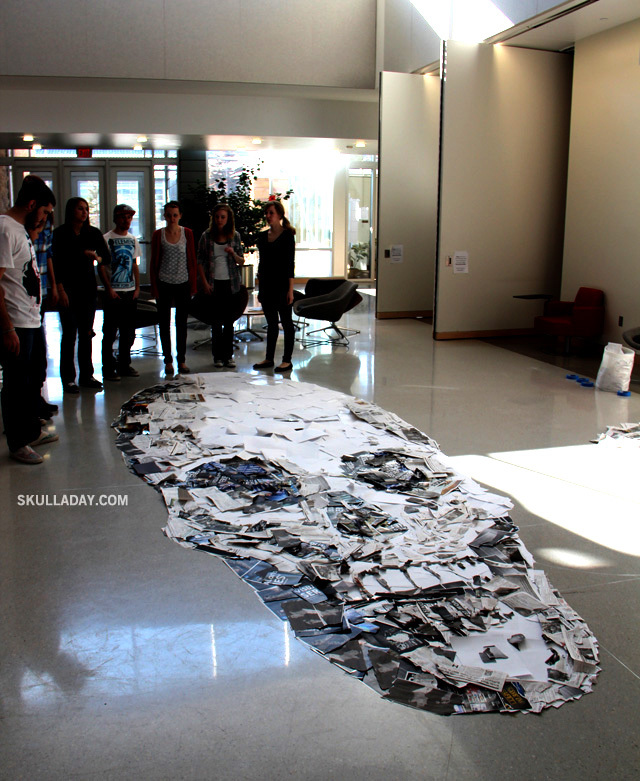 Thanks for sharing your skull, Paul! Save your pennies so that you might have a chance to trade them in for a nickel's worth of awesomeness from Mark Knoll. 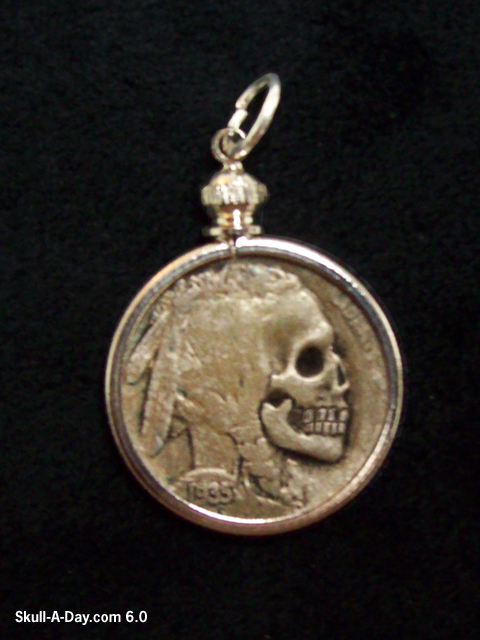 Mark carves skulls, by hand, out of cow bone, antlers, wood, and even Indian head hobo skull nickels. These tiny carvings are impressive to say the least. You must have an eye for detail when you're able to create such miniscule works of art. That or a really good set of glasses. Mark has been here before, and now he's back with an Etsy store in hand so you can get a nickel of your own. Thanks again for sharing the great work, Mark! Parade float artist, and past contributor, Marcus Pollitz in Pomona, California created this skull using natural materials. 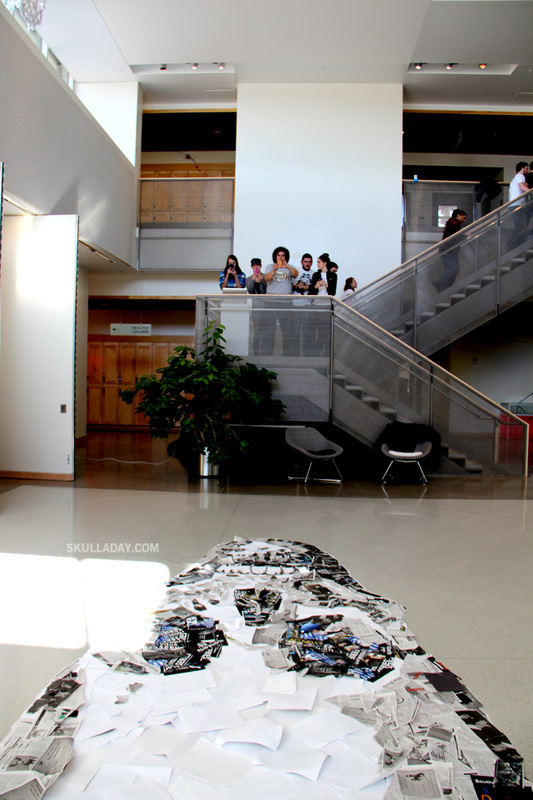 He wrote: " This is 1 of 12 skulls made for Dia de Los Muertos at the Autry National Center. The display '12 Tribes of Seed' are all sculpted and decorated in natural materials. This pepper skull is made up of several different chiles, peppercorns, pepper seeds, and crush sweet rice." It is truly amazing how the natural world provides us with such wonderful items that we can create with. I really like the look of the fire that seems to be erupting from the top it captures the look that one may expect to experience if one were to mistakenly eat a spoonful of habenero relish not realizing that a spoonful was way too much. 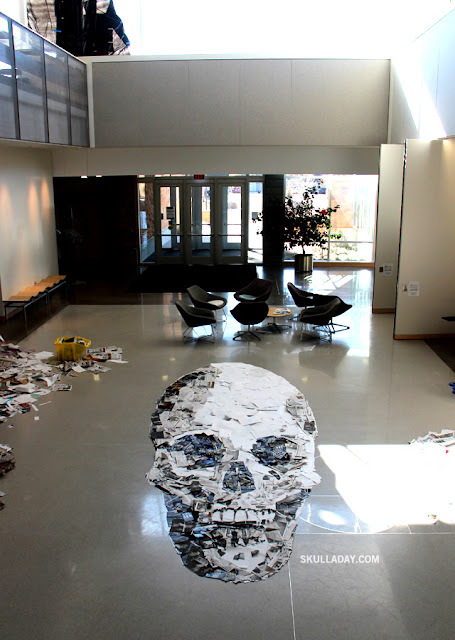 Thank you for sharing once again some of your interesting skull related work with us. Don't forget you have until 11:59pm Eastern USA Time TONIGHT to make an entry comment to win a Dia de los Muertos Pendant from Azurafae. You can find the original contest post by clicking the side bar ad, or this link. Ashraf Ali aka The Drawing Beard from Swindon UK created this skull artwork. I love looking up at the stars and admiring the constellations at night, and the watching the cloud formations during the day. We live on a very beautiful planet in a gorgeous solar system, so of course artwork inspired by this, interests me. If I saw a skull appear in the sky, I would be intrigued. This skull reminds me more of a light symbol similar to Batman's. Sort of makes me want to figure out how to make that happen at night. You can find more of Ashraf Ali's work on Facebook, Blogger, Society 6, and Tumblr. 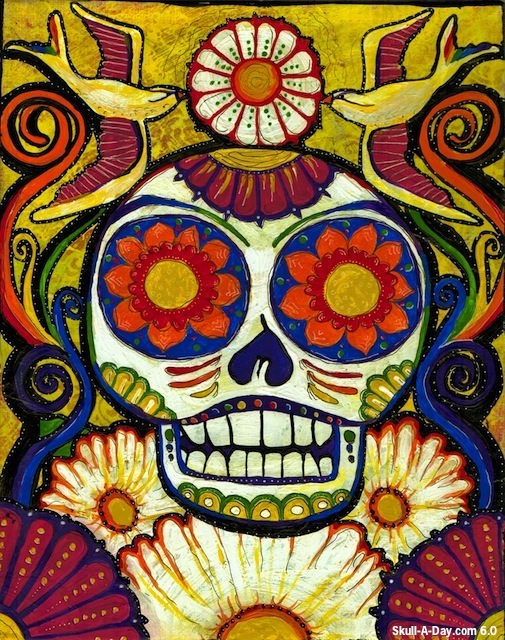 Don't forget you have until 11:59pm Eastern USA Time Friday, February 8, 2013 to make an entry comment to win a Dia de los Muertos Pendant from Azurafae. You can find the original contest post by clicking the side bar ad, or this link.